When preaching the benefits of lightweight race bindings to your side-country ski buddies, it’s best to avoid showing them your new Ultra binding. As minimalistic as they come, the Hagan pincers don’t instill a ton of confidence in suspicious-folk and you’ll likely be laughed at. Only after skiing such bindings regularly in sticky situations will you come to rely on them like we do. Who needs two springs anyway? Monolink is the new anti-redundancy hotness: a traditionally-sprung right-wing works in conjunction with a spring-less left-wing. An elastic political compromise! Half the springs, half the effort? Not quite, but the bindings operate smoothly and are guaranteed to not make you slower*. Other novelties include a heel flap with adjustable resistance so you can fine-tune your transition-friction. The ski/walk lever rolls on a smooth nylon bearing and couldn’t be easier to operate. Even the step-in has been refined to reduce boot slippage. Ultra Hagan, ultra light, ultra cool: shed a few more grams and chase those elusive peaks and podiums. Monolink technology minimizes moving parts and weight. Adjustable heel flap for personalized resistance. Constructed with aluminum alloyed with titanium. Optional crampon receptor easily screws on. Pictured but sold separately! Optional adjustment plates let you move the heel. * Guarantee only valid in Puerto Rico. Bottom Line Half the springs, half the problems. I have these now on a pair of hagan ultras and my race skis. I have them on adjustment plates on both skis. The pair on the ultras have been well used. The titanium heel springs wear much faster than the steel springs on other race bindings, but they're easy enough to replace and swap out. The heel flaps have a tendency to come loose, flop, then break when you step on them. But again, easy enough to manage if you keep them reasonably tight. If you do break them, it's a quick swap out and the flaps are replaceable. You can rotate them sideways and use them in flat mode if you do break the flap, so it's no biggie there if they do break. The toe lock is on a wheel, which makes for smooth action. I was skeptical of durability there, as opposed to ratcheting over grooves like some others, but no issues yet there. I mounted the 2017-18 version on Hagan Ultra 65 skis for Scarpa Alien 3.0 boots (for ultra color stylin’). So far I’ve used them for only one race, and with even no prior use/practice, everything worked smoothly: toe lever, heel flap, entry, exit, etc. 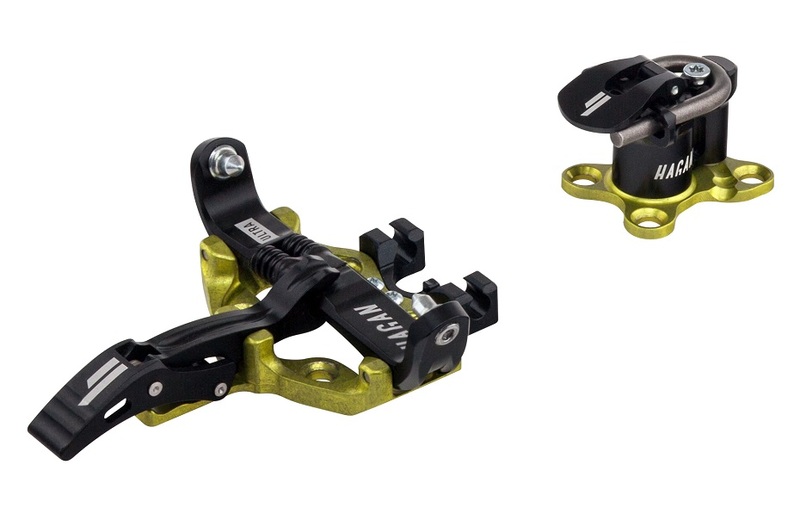 I’ve previously used two pairs of the Hagan ZR, and the Ultra 65 differs only in the pincer springs (down from four to two, which still work fine, despite the boasting of a certain brand about its “six pack”) and the crampon clip (now removable, yet no longer included). The only long-term durability complaint I’ve ever heard is that the heel flap can break if you’re not careful to keep the adjustment screw tight so that it’s always flat on the pins when skinning. But that’s an easily replaceable part anyway. And of course the Ti heel pins will eventually notch, but you can double the life by reinstalling them upside down once they get excessively notched. I have these as ATK SL Evos (Hagan Ultras are just rebranded versions). Nice very lightweight race binding, weigh in at 110 g on my home scale. The two spring method seems to work just as well as the classic four spring, I can't see much of a difference, but if it saves weight then great. The toe lock out is efficient and pops up and down with a reassuring snap. What I really enjoy is that the quality of machining of these bindings is well above other bindings I've owned (plum, dynafit, etc) ATK has removed every excess portion of metal and you can see that both the quality of metal used and machining processes are top notch. I got a pair of these before SkimoCo had them in stock, so unfortunately I didn't get to give the good fellas of Booter Friday fame my business -- but I figured I'd throw a review up here for any potential/interested buyers. Short version, not only does the mono-link work well, I actually think it works better than a traditional two-spring (duo link?) race binding (e.g. Low Techs, ATK race, or Plum 145, the latter being my typical choice). I got the Ultras mounted up on a pair of Hagan race sticks this past fall and was immediately impressed with the smooth lever operation when I did some carpet transitions. It snaps forward and back easily, but not so easily that you'd be unclear on whether your toes are locked or unlocked while you're panting at a skin-to-ski transition. I like the shorter lever for this purpose too, since you're not liable to over-crank it just because you're moving quickly. What's good about the mono-link, though, is that it doesn't seem to bite as ferociously as a traditional tech toe. This gives an extra millisecond to wiggle your boot fittings to keep it metal-on-metal and not gouge chunks out of the plastic toe -- something I did a lot during my first year racing. Caveats: the Hagan NA distributor was very confident that the binding had an unofficial "flat mode" created by rotating the heel piece, but my heel piece is totally fixed. Not sure if this was a shop error that happened in mounting, but if flat mode is important to you, definitely check into this. Hi TSB, the heels should definitely turn! That is the release mechanism as well as the method of switching to flat mode. If it's really not turning for you, something is wrong and you should have it rectified.